Heat oven to 375°F. In large bowl, stir cookie mix, 1/2 cup butter, the egg and 2 tablespoons beer until soft dough forms. Stir in crushed pretzels. On ungreased cookie sheets, drop dough by rounded tablespoonfuls 2 inches apart. Bake 9 to 11 minutes or until set. Cool 1 minute; remove from cookie sheets to cooling racks. Cool completely before frosting. Meanwhile, in 1-quart saucepan, heat whipping cream and 2 tablespoons butter to just boiling over medium heat. Remove from heat and add chocolate; stir with whisk until melted and smooth. Stir in 2 tablespoons beer. Pour into bowl; cover and refrigerate about 1 to 2 hours or until spreading consistency. 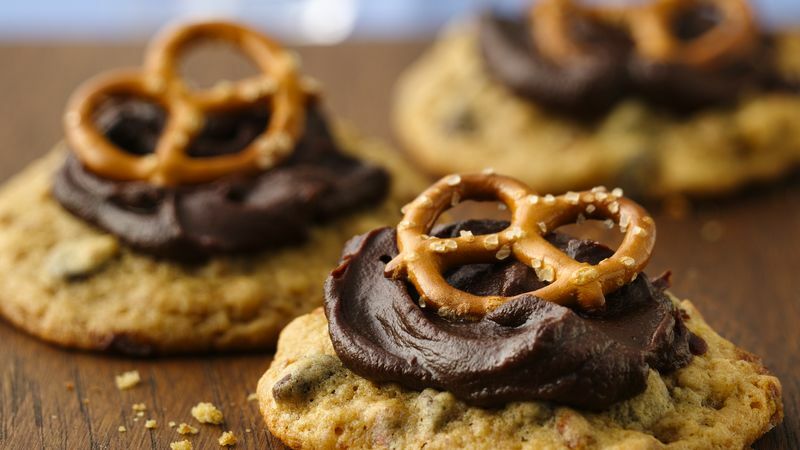 Spread about 2 teaspoons frosting on each cookie; top each with 1 pretzel twist, pressing in gently. Store loosely covered. For best results, be sure to use real butter in the frosting.